Beautiful interpretation of the sketch! I love all your pretty details and the ribbon on the bottom looks fabulous!! Gorjuss!! Love the layout with the flower. What a great take on the sketch! 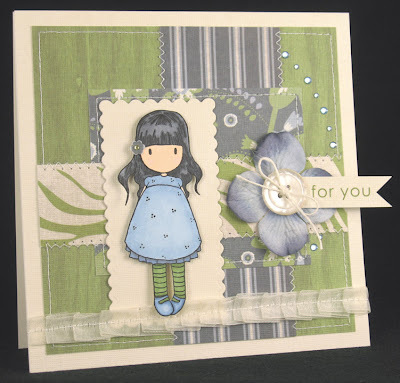 Love the colours, your layering is fab and your image is coloured beautifully. Nice touch with the flower in her hair! Nicki. 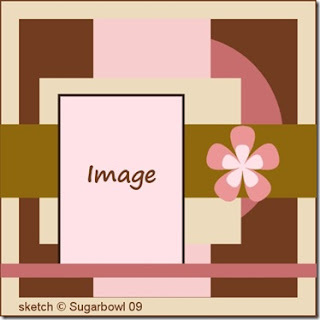 Great coloring of the sweet image and such yummy flower & papers. I think your lace turned out great for the bottom part. Lovin' the bling on the side too. Those rhinestones really pop in the pic. So Gorjuss! Love the sketch and your card!! It may have been a struggle....but it was worth it...your card is great. Such a pretty card Maureen! I love the colors and the papers. I had fun playing the Sugar bowl as well. I think you should definitely give it a try at Midnight Madness Sketch, you're cards have beautiful color, and not to mention up to $500 prize they are giving up, each week's entry is one more chance at the pot.